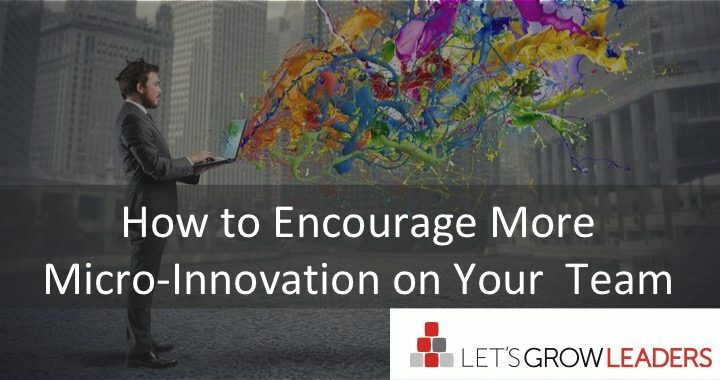 Are you looking for ways to uncover more micro-innovation on your team? Is your team a bit stuck? Stuck doing things the way they’ve always done them? Stuck with workarounds to systems that no longer work? Stuck in silos, unaware that there’s a best practice right around the corner that would make their work easier? Sounds like it’s time to encourage micro-innovation — helping your team to find small ways to make things better, for themselves and for their customers. We were working on 2019 strategic planning with a group of high-performing managers. Cedric raised his hand, “How many of your people spend a stupid amount of time on workarounds because of outdated systems or processes?” Every hand in the room went up. “When’s the last time you really looked at who is doing what and why this is happening?” Most eyes drifted down to avoid what Cedric knew was a rhetorical question. Brilliant. The Workaround, Workout Week was born. For those of you who’ve read our book Winning Well, think confidence bursts (click and scroll down) for micro-innovation. THE WEEK BEFORE: Create a ruckus to get people excited about identifying workarounds that need to go. Advertise the week and add fun to the mix. Signs? Themed breakfasts? Balloons? Cube-top reminders? The point is to encourage every member of your team to bring forward all the workarounds they can. MONDAY: Make it easy to anonymously submit the workarounds. Provide amnesty if a well-intentioned workaround breaks a rule. The point is to get a clear sense of how your people are actually getting work done in your organization and figure out if there’s a better way. TUESDAY: Give your team time to prioritize the list by impact and ease of fix. WEDNESDAY-THURSDAY: Invite your team to submit their best micro-innovations for a more permanent solution. FRIDAY: Meet again to discuss best ideas (invite key stakeholders as appropriate), plan for next steps, and recognize and celebrate your micro-innovators who came up with solutions. Make it easy for your team to solicit their best ideas by asking simple questions. What’s your best idea for improving the customer experience? What’s the simplest idea you have to make your job easier? What’s the best idea you’ve heard in a long time around here? You can ask a question a week via email or text. Some of our clients have also asked us to weave such questions into their micro-learning programs, texting a question a week to encourage micro-innovation. Managing by walking around can mean lots of things. When’s the last time you just starting walking for a curiosity tour … searching for best practices and micro-innovation? We are neck-deep in research for our next book and are looking for more best practices for encouraging micro-innovation and front-line problem-solving. Please leave a comment or drop us a note at info@letsgrowleaders.com and share your best practice. Posted in courageous cultures and tagged eliminating workarounds, innovation, micro-innovation. Awesome article as alwaysi am glad to gain this remarkable information from you. Kavleen, Thanks so very much! We really appreciate your support.